Gondwana’s new Katmailand & Kenai Peninsula Bear Ecotour, and our popular Northern Lights Ecotour focus entirely on Alaska’s natural wonders. This is the perfect trip for nature lovers, and About Travel agrees! They featured our two Alaskan ecotours on their list of The Best USA Guided Tour for Every Personality. Though the bears at Kenai are the stars of this ecotour, we have more planned for our guests as well. “You might get lucky and spot whales, sea otters, puffins, and sea lions in Kenai Fjords National Park.” Also within the park lies Exit Glacier, one of Alaska’s most famous ice masses. Renowned for being an example of climate change, this glacier has been researched by scientists and rangers to measure the impact of global warming. Be prepared with an adventurous spirit as you hike through this pristine wilderness. This inclusive 7 night ecotour sets the vacation up for success, with all lodging, tours, and travel pre-arranged by Gondwana. With the adventures departing in June and July 2017, it’s the perfect time to visit Alaska during the warm summer season. As an added bonus, Gondwana carbon offsets all of our guests’ flights, which makes travelling guilt-free. “If you’re wanting a natural excursion that focuses less on wildlife spotting and more on star gazing, Alaska’s Northern Lights are truly magical.” The northern lights are active between September and March, so that’s when Gondwana goes! Because Fairbanks has typically clear skies, chances of seeing the aurora are even higher – up to 90% if you stay more than three days. We search for the northern lights nightly, and personally wake up guests to see the lights when they’re active. This personalized service allows guests to get a good night’s sleep, without worrying if they’re missing the light show. 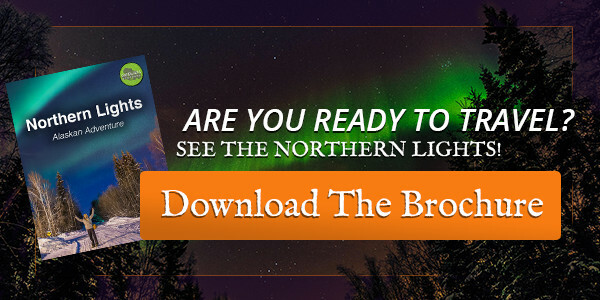 An unforgettable winter experience, the northern lights are a must-see for nature lovers. In addition, Fairbanks has a ton of activities to keep travelers occupied during the daytime. Dog sledding, soaking in the Chena Hot Springs and visiting with reindeer exemplify the variety that this region has to offer. For nature lovers, nothing beats exploring new territory. So visiting Alaska, or “the last frontier”, with all of it’s organic beauty is a dream come true. Plan an adventure to Alaska with Gondwana Ecotours, and see for your yourself! Join us as we visit Brooks Lodge, where we’ll witness the world’s largest brown bears fishing atop waterfalls at the famous salmon run. Search for moose, whales, sea otters, puffins, orcas, eagles, sea lions and more throughout the Kenai Peninsula.